Money Matters: Bernanke Will Drop Interest Rates To 4%!!!!! Bernanke Will Drop Interest Rates To 4%!!!!! BREAKING NEWS: BERNANKE WILL DROP INTEREST RATES TO 4%! ARRRRGH! As expected, markets overseas echoed yesterday's panic on Wall Street. Ever since the .com crash, investors have begged wizards to write new spells that create instant wealth. The wizards used two spells: the 'let's exploit Chinese labor even more' spell and the 'let's create pre-Great Depression investment trusts of various sorts' spells. Both no longer produce easy wealth because the basis of both is piling on debts in the Western empire's populace. The last gasp of this long process of indenture came when Greenspan had to lower interest rates 4% below the real rate of inflation which caused the balloon we now see going bust. Today, I talk about SIV funds, another goofy creature created by these magicians. Hyman said he sees a ``better economy next year,'' with stocks and Treasury yields rising. Slacker growth this year will ``put inflation aside'' as a concern, he said. I was about to publish my story warning about repeating the Greenspan super-low interest rates while pretending there is no inflation when this hit the news wires! And of course, this is PURE INSANITY. And stocks are shooting up! Obviously, Bernanke and his gang surrendered to the financial class who brought this mess down on our heads in the first place. Now they are safe...until China starts teaching us Mandarin. We are so doomed. But the party will roar on, houses will sell, America's debts will increase to 200% of our GNP instead of 100% and our empire will lose its entire industrial base and anyone saving money will be wiped out, totally. Traders are braced for another week of turmoil after the near breakdown of America's $2,200bn (£1,100bn) market for commercial paper. "It would be far too premature to judge this crisis over," Mr Summers said. "I would say the risks of recession are now greater than they've been any time since the period in the aftermath of 9/11." In Germany, it emerged that the state-bank SachsenLB may have accumulated $80bn of exposure to risky assets through a set of Irish funds kept off balance sheet. The biggest losses stemmed from structured investment vehicles (SIVs) which involve using short-term credit to buy longer-term assets, creating a mismatch in maturities. *snip*Federal Reserve data shows that the outstanding stock of US commercial paper has fallen by $255bn over the last three weeks, a sign that borrowers have been unable to roll over huge amounts of debt. The fall is comparable to the sudden shrinkage that occurred at the onset of the dotcom bust, and may have the effect of draining liquidity. $80 billion. Whew. Now we know why the officials running the Bank of Europe were in such a panic on the 12th and onwards. As the individual bankers came hat in hand and produced the bills they owed, there must have been a fainting fit at the central bank. Is this the end of the rout? Is there a route out of this rout? Or is this a sign of interior rot? Obviously, the answer is the last. This rot is very expensive and the seeming health of the world banking system was like a giant oak tree that has been hollowed out by lightning bolts and bugs. The tree used to illustrate this story is on my property. It is hundreds of years old and the crack is twice as tall as I am. 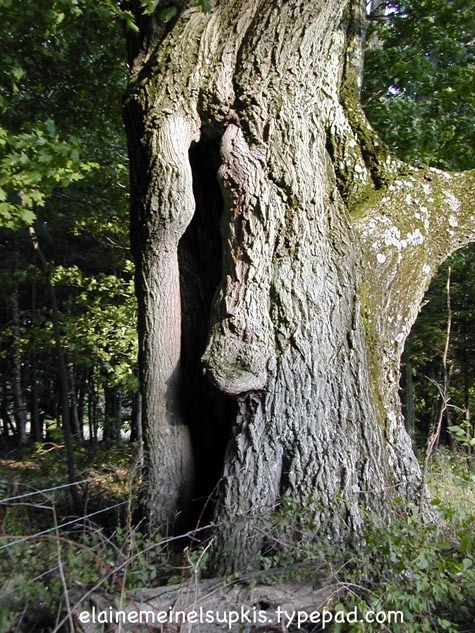 When lightning hits trees, it does two things: it sears the outside bark, leaving a wound. And it also can travel up the center of the tree because this is where the water is easily heated by the bolt. When I cut down lightning trees, it is easy to see the burned exterior and the zapped center. Bugs love these lightning trees and chew up the weakened fibers. Then owls, woodpeckers and others move in and widen the wounds. Then foxes and bears move in as with my great oak which I named 'Sherwood Forest' beause the tree is so big, it looked like a forest when seen from afar. The mighty empires of the West have been struck by several lightning bolts: WWI, WWII and the Hubbert Oil Peak hitting the US. The 'strength' of the US sector in particular, is constantly harped on by our rulers but even if the amount of business is still huge, the GNP huge, this is all based on debts on every possible level, corporate, financial, housing, consumer and above all, state and federal debts. On top of all this debt is the astonishing and unsustainable trade deficit. In all, this is a totally hollow tree ready to blow over in any storm that comes by. One storm is the one launched by bin Laden who has inspired attacks on the financial hub of the West: Wall Street. His determination is, if he gives enough little pushes, this will egg the US into futile invasions where the tendeny to try to profit off of war sinks our economic ship. He understands us perfectly and as he hoped, our spending on war has been totally out of control and coupled with tax cuts, has made the red ink worse. The chances of him winning his war with the US has risen to 100% at this point, an astonishing feat. Of course, it helps him greatly that Bush and his gang actively want to destroy America. The reckless US has conned many more cautious nations like Germany into playing bizarre and stupid funny money games and now Germany will get to relive the Weimar Republik. The vast sums poured into the toilet by the Bank of Europe are unsustainable. The euro is strong despite this only because the malicious Asian central banks are forcing up the euro so they can destroy Europe's export markets! A strong euro is a sign that the Central Banks in Europe have failed in their mission due to their lack of FOREX reserves. The US dollar is weak because the US has printed up so much money for so many years, taking advantage of the Asian desire for weakening their own currencies, no one notices this anymore since a weak dollar is always stronger than a weak yen---except for last week when the Japanese had a huge scare about all this. The yen fell, snapping a two-day gain versus the dollar and euro, as speculation the Bank of Japan wont' raise interest rates spurred fund managers to send money abroad in search of higher returns. The yen slipped against all 16 of the most-active currencies as the odds the central bank will lift the overnight lending rate next month dropped to 20 percent from 30 percent yesterday, according to Credit Suisse Group. The yen has risen 7 percent against the dollar this quarter as credit-market losses caused fund managers to repay yen loans used to fund carry trades. Stocks on the Nikkei fell over 200 pts during the last 12 hours. Japan has two tools it uses: super-low interest rates that encourage everyone to not hold yen and buying dollars and euros no matter what. Stocks depend on exports because the need to keep interest rates low in Japan rests upon preventing the Japanese from buying stuff. This is the artificial depression there which is triggering a REAL depression across the globe! For the world's #2 economy and #1 export profiteer can't opt for depression without destroying world trade. I can't emphasize this enough. Nearly universally, everyone with negotiating powers thinks Japan is helpless in this regard and not cynically generating a depression. Both Japan and the Western G7 nations depend on China to wring out inflation via low-wage workers. Now they are moving to India to gain the same bonus but this is a doomed search because all the Chinese have to do is manipulate their currency the same way Japan manipulates their currency! And China is finished listening to the whining in the West as these same people let Japan destroy their collective export markets. To get the Chinese to stop, we must stop Japan. And this means we must stop the carry trade and the debts this brings. Again, it is my strong contention that the West must stop generating both trade and debt red ink. China sold 600 billion yuan ($79 billion) of bonds, the most ever, to fund a company that will help invest the world's biggest foreign-exchange reserves. The Ministry of Finance sold the 10-year bonds to the central bank at a coupon of 4.3 percent. Future sales may include debt maturing in 15 years or longer, the ministry said in a statement. I predicted several months ago that China will now begin to hammer Japan in the realm of yen values. As the Bank of Japan forces the Japanese housewives to invest in euros and dollars, the Chinese will counteract this and buy yen. This will screw up Japan's trade surplus and prevent Japan from underselling China in foreign markets. And this is why the yen never got even close to the 130 yen to the dollar the Japanese government desired and even openly talked about in July. Next prediction: the Japanese will begin to buy up yuan and try to drive it upwards. This means both won't be buying dollars which will drop. China figures the US won't be buying much of anything pretty soon, anyway. Chinese President Hu Jintao met here with visiting German Chancellor Angela Merkel on Monday, calling for closer ties and broader cooperation in various fields. "Developing China-Germany relations based on the principles of mutual respect, equality and mutual benefit meets basic interests of both peoples, which is also conducive to the China-Europe ties and the world's peace and stability," Hu told Merkel during their one-hour meeting. The US Zionist war machine has forced Germany to cut economic ties to Iran in preparations for the Apocalypse but the poor Germans desperately need to make money and so they are back in China, hat in hand, begging. The Chinese don't mind Germany being shoved out of Iran, more oil power for China! The US can't force China to divest or China will do the same to us. Policymakers and investors have been obsessed in recent years about the potential for a hedge fund collapse to spread financial panic. But it seems one of the biggest threats to stability is coming from the age-old risk of short-term borrowing to fund investments in illiquid long-term products. In a corner of the market few people knew existed, regulators are scrambling to understand what is happening in structured investment vehicles (SIVs), a breed of often huge, mainly bank-run, programmes de signed to profit from the difference between short-term borrowing rates and longer-term returns from structured product investments. Time to examine yet another instrument of financial destruction created by Western banks and financiers who couldn't make money the old fashioned way due to inflation and low interest rates that made it impossible to keep money growing by simply lending it. The catastrophe of the Greenspan rate cuts are barely understood by Westerners who think this boon was a great thing and who are agitating for a repeat. The steady ability of money to 'grow' while being lent at a realistic interest rate cooperates with and creates the ability to lend via attracting savings. But if it can't and in the US, it isn't, attracting savings, desperate savers and investors are forced into riskier and riskier investment schemes in order to beat inflation and the low interest rates which compete with them for money. In other words, low interest rates are unfair competition. Low interest rates soak up all the 'good' investments, all the 'prime' borrowers. So if one wishes to make more than the official, fake rate, one has to sell loans to bad credit risks who are locked out of the easy money soda fountain. Spreading the risk while making ever-riskier loans led to many tricky alphabet soup funds like SIVs or ABX-He funds. The collapse of the Sachen Bank in Germany was due to SIVs and it is time to examine these things. The market for structured investment vehicles (SIVs) has matured steadily over the past few years, to the extent that what was once a niche credit area now accounts for a major part of the structured finance arena. The latest development is a tweaking of the SIV idea to form SIV-Lites - a combination of collateralised debt obligation (CDO) and SIV technologies. All these hedges were started to provide an alternative funding source but they all grew into monsters under the Greenspan free money regime. They all have one thing in common: the CDOs that make up these various programs are all attempts at selling debts very recklessly. It is interesting the magicians cooking up this SIV spell threw in the word 'Lite' as if this were a diet product and not pure poison. I suppose, it does make one's wallet 'lite'! So what is driving this development? Edward Cahill, European head of CDOs at Barclays Capital in London, says his desk is focusing on SIV-Lites because traditional SIVs are not as profitable as they used to be. "The reality of the market is that spreads have tightened, so traditional SIV structures, with a very thick 10% BBB tranche and then commercial paper (CP) above it, don't work. I think it would be very difficult to start an SIV from scratch right now," he says. This article is just 15 months old. Note how, by 2006, interest rates were now climbing rapidly so investors weren't being forced into the risky markets for small returns so the risky markets had to increase returns to attract investors so this became an even more dangerous game as the creators of SIVs had to make them look safe while making them much more dangerous. In the end, the dangers overwhelmed all common sense and this is why there was so much money chasing so many deadbeats in the American real estate markets. Real estate is a classic investment that is 'solid.' It is real. But NOT when the asset is over-priced by 50-60%! Then it turns to poison which is the case here. This SIV money and the other fund finances opened the floodgates during 2006 and this caused the housing boom to continue a little longer, it was dying in 2005. Now it got a second wind but one that was very dangerous. I yelled about double loans where people used loans as down payments and then took on a mortgage on top of all this. It was a bad sign that the market was out of control. And once the Fed raised interest rates to something closer to the real rate of inflation which is NOT 3% a year at all but is 5%, this killed all these schemes. Which is why all the big financial houses want the cheap money back! They are committed to this new regime, the one that is destroying us. They made money off of it and..THEY CAN'T UNWIND OR BACK OUT OF THIS...EVER! They MUST do this. Forever. This is the monkey with its hand caught in a jar, unable to let go of the cookie. So what distinguishes an SIV from a CDO? Greg Drennan, London-based vice-president of Morgan Stanley's CDO structuring team, explains that there are two fundamental differences between the two vehicles: "SIVs have a cheaper cost of financing because they can raise money in the CP market with limited liquidity. The second difference is the operating company-type characteristics an SIV has." Unlike a CDO, an SIV is an ongoing open-ended vehicle; it can change size and re-finance. The open ended nature of the SIV means instability. Note also, they were 'cheaper...financing' which added to the carry trade meant the need to use these things to make 20% profits was a great temptation. I bet a lot of the sudden collapse of international overnight banking was due to these things coming due and needing new infusions of cash. If the Japanese keep the yen low while the West raises interest rates and the yen weakens, this means the diffrential will continue to widen and the ability to create more money for these funds will rise. The sudden rise of the yen against the euro and the dollar as well as all other major currencies killed this cycle in the middle of the month. Re-establishing it required lots of effort. They really do hope this has succeeded. And this is because they don't look at the final price tag: the utter end of all industrial output for export in the West. Securitization in the simple term means the creation of new securities and comes under the discipline of financial engineering. Securitization refers to the creation and issuance of new fixed income securities, whose payments of principal and interest are derived from cash flows generated by pools of assets acting as collaterals for the aforementioned securities. This structuring leads to the repackaging of cash flows into securities by adding value in terms of credibility and liquidity. Traditionally Securitization has been used a mode of financing by converting the illiquid pool of asset into more liquid marketable securities, but contemporary structuring is also motivated by higher returns, diversification, hedging objectives apart from plain vanilla funding. Securitization history can be traced back to 1970 with the structured financing of mortgage pools in the USA. This was motivated by promotion of secondary markets in mortgages to allow liquidity for mortgage finance companies. Since the mid 1980s, better technology and more sophisticated investors have driven the asset securitization business as one of the fastest growing trend in capital markets. The growth can be visualized from the fact that outstanding securitized debt in international market is $6.6 trillion as of the second quarter of 2003 . I included this history of all these paper instruments for passing along loans and re-selling of loans because these riskier financial instruments were born right at the same time the US changed from a gold-based currency to fiat paper currency and inflation took off. Note the 'added value' earned by the simple act of 'repackaging' loans! This also created 'liquidity' which means money flows rapidly from one place to another and can't be trusted over long periods of time. The fixed mortgage somehow survived all this but note that it nearly vanished a year ago. Half of all mortgages were floating rates. In the future, I bet all mortgages will be of this nature due to the financial collapse of our currency and how all currencies now interact. The post-Bretton Woods II world of relative value means instability. Which can make some rich but will make most of us poorer. If the Fed drops interest rates below the rate of inflation again, this will increase the floating mortgage rather than a stable mortgage. Half of the financial woes hitting the US are due to FIXED RATE mortgages that can't be raised so inflation is eating up profits even with the forwards-loaded interest rate pay-off that is a feature of all fixed rate mortgages. You pay the interest for the whole loan before you pay off increasing amounts of the principal. The fixed rate mortgage managed to survive 40 years. It will be missed when we lose it forever. Note that rates for these mortgages is rising. Some banks offering $500,000+ fixed rate mortgages are asking for over 7% now! Show what they anticipate future inflation to be. Affluent retirees are expressing concerns about the stock market, with many believing that they won't have enough money to last them through their lives. In its semiannual "Advisor Outlook" study, Schwab Institutional reports that the affluent are "anxious about retirement and their optimism about the economy is waning." ETFs? They are the secret sauce to keeping clients' portfolios propped up and hence the economy afloat? Certainly ETFs are an inexpensive investment vehicle, but they aren't the most sophisticated of instruments. That is, unless ETFs are woven into an investment strategy that ramps up asset allocation in certain areas, or are utilized as vehicles that play off other instruments. Otherwise, they are rather plain vanilla in scope. Americans will be lucky to have any money for retirement at this rate. And the SIVs and other money schemes not to mention the pirates and hell hounds in the hedge fund island group, can't attract money unless the Fed kills interest rates. So they are demanding this like crazy. As are homebuyers stuck with mortgages that are like credit cards. "Only 32 percent of advisers currently invest in private-equity deals; of these advisers, only seven percent plan to invest more over the next six months. Sixty-five percent of advisers have no plans to step into the private-equity arena with investor assets in the near future. Similarly, only 31 percent of advisers currently invest in hedge funds, with eight percent planning to invest more in the next six months. Sixty-six percent of advisers say they have no plans to invest their clients' assets in hedge funds," the Schwab study finds. And this is the dry side of equity. No longer are the pension funds pouring money into these various paper schemes. The money is going to government resting points where they finally earn a real interest rate...barely. The Fed and the Bank of Europe can't make up for this retirement investment money. Cheyne Capital Management Ltd., whose Queen's Walk mortgage bond fund reported losses in June, may be forced to sell assets backing a $6 billion commercial paper program after a global credit market rout. The Cheyne Finance LLC fund has been selling investments and has enough cash to repay commercial paper due through November, London-based hedge fund company Cheyne Capital Management said in a statement. Standard & Poor's cut Cheyne Finance's ratings yesterday, citing the deteriorating market value of its assets. And so it goes: the Fed will do the foolish thing and make things much, much worse on every level as they struggle to keep a bad status quo going. Each year, it gets harder and harder to change direction and the pain of this change grows greater. If we keep playing this stupid game, we will end up in impossible trouble and bankruptcy. 4%?!?! What the hell are they gonna price U.S. debt at?!? Is the assumption now that inflation is at .5% and will remain there for 10 years?!?! A bald faced LIE. Why don't they just print U.S. currency on toilet paper. It'll be cheaper and more reflective of the actual value of the dollar. Are you talking used toilet paper? "THEY CAN'T UNWIND OR BACK OUT OF THIS...EVER! They MUST do this." I give you ... the golden straightjacket!!! People of the lie, don't forget. You are a f#cking moron. hello this topic is very interesting thanks for sharing this information about Bernanke Will Drop Interest Rates To 4%!!!!! Hi!This topic is very interesting, Thanks for sharing the information on Bernanke Will Drop Interest Rates To 4%.i loved this and simply love to read such kind of posts based on finance and mortgageloans and stuff. This post is a little old, but the point its quite interesting, the percentage from then and now is very different, but you can get the idea that is always going to increase. Wow! That is awesome news! I could adjust my budget sooner.